Blog: Jabra | Avcomm Solutions, Inc.
Help your Jabra headset become smarter. While you may be familiar with high-quality devices from Jabra, such as Evolve headsets and Speak speakerphones, you may not know that Jabra also provides innovative, AI-enhanced software that supports its USB (and Bluetooth with Link 360/370 adapter) products. Jabra Direct 2.0 is available now — and, it's free. •Automatically get firmware updates so that your headset is always updated and secure. •Personalize your headset settings according to personal preferences, or company requirements. Functions such as ringtone, sound optimization for music, audio protection level, sidetone level, and many more areas can be controlled. •Remote call control (answer/end/call, mute, redial, etc.) for UC platforms. Jabra Direct has an intuitive, user-friendly interface that provides overall status of each connected device, and notifications of updates. To receive firmware update notifications, go to Settings and switch Update Notifications to "On." This alerts you to open Jabra Direct, and run updates as they are available. Key updates in Direct 2.0: Enterprises that use a proxy server, and those who prefer on-premise deployments, are now supported. Jabra Direct 2.0 will be able to connect to the Internet and receive settings and firmware in proxy-based environments. For enterprises that prefer not to be connected to the Internet, change settings or firmware updates on Jabra devices can be managed and controlled by the enterprise, within their firewall. Another update: Direct 2.0 provides data about end-user name and PC/Mac name, which is also then added as a service in Xpress 2.0. Additionally, Jabra announced that it has certified the handling of customer data in the Jabra Cloud with the SOC 2 declaration. Jabra is committed to protecting customer data against unwanted usage by a third party. Download Jabra Direct 2.0 for Windows or Mac, from the Jabra Direct page. Jabra Engage 50 is a new generation of digital headsets that provide additional call analytic metrics. The Engage 50 is the first Jabra corded headset to have the chip in the headset itself, making it a true digital headset. The Engage 50 uses the very latest chipset, and this, along with the positioning of the chip, delivers enhanced functionality and user experience. No longer are headsets an accessory to a phone system, simply transmitting human audio; they are now a "business critical element of the whole infrastructure," according to Jabra SVP Holger Reisinger. These digital devices provide call analytics that in some cases can listen to how people say things, extracting human sentiment from the human voice. Reisinger says that Jabra is providing proof of concept with new KPIs for the contact center, such as measuring agent friendliness against customer anger, in real time. Rather than recording calls and doing transcription analytics, this information is measured in real time and shown as a graph, in front of the agent who is on the call, so that the agent can adjust tactics, mid-call. For organization-wide updates and inventory management, we recommend Jabra Xpress, a free online tool. 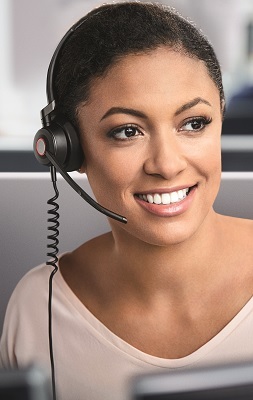 Read all about Jabra Xpress on our blog, here: Jabra Xpress: Mass Headset Deployment Made Easy. This program allows IT staff to create software packages for remote updates, configurations and asset management of Jabra USB devices. Jabra Xpress has also been updated to a 2.0 version. To create an account to begin using Jabra Xpress, or update existing Jabra Xpress to the 2.0 version, go to the Xpress microsite: Jabra Xpress 2.0. Jabra Direct 1.0 and Jabra Xpress 1.0 will be discontinued June 30, 2019. We recommend updating to the new 2.0 versions today. Please reach out to us with any questions you have about these updates, and let us know if you need any assistance: 1-866-998-9991. Five years ago, it was proclaimed that customers would no longer call into businesses; that they would prefer to find support via email, social and Chat channels, and organizations scrambled to train and ramp up those areas in their call centers (updating the terminology to "contact centers"). Yet, here it is, almost 2019, and it turns out, customers are still calling businesses when they need help. Research has shown that customers start with online assistance for simple questions; however, as matters become more complicated, phone calls remain the preferred way to contact companies. This means that customer service agents are expected to know more detailed information and handle longer, complex calls. The pressure to produce results in a cost-efficient manner means that data analytics are crucial. With this in mind, Jabra engineered a headset that meets these needs by offering digital sound, data analytics, Busylights on the ear speakers, and is comfortable to wear through long, demanding calls. The Engage 50 corded headset is available in both Mono and Duo versions and ends in USB-C. The generous-sized leatherette ear cushions have a conical design, so that the cushions rest securely on the ear. How is the Engage 50 a Digital Headset? A processing chip in the headset — rather than in a control unit or cord — makes the Engage 50 a digital headset. 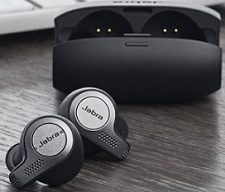 While most wireless headsets are already digital headsets, the Engage 50 is the first Jabra corded headset to have the chip in the headset itself. The Engage 50 uses the very latest chipset, and this, along with the positioning of the chip, delivers enhanced functionality and user experience. 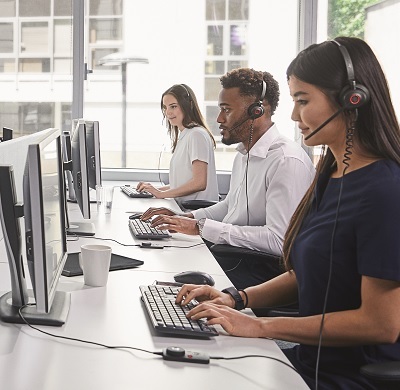 Along with Jabra Direct and Jabra Xpress, call analytics for the business, and on-screen microphone positioning guidance for the agents, are provided. 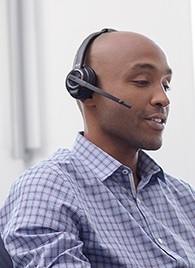 A great headset, along with Jabra software, improves customer satisfaction. 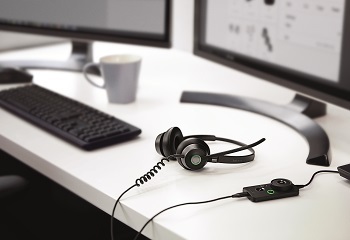 Jabra Xpress 2.0 is designed for IT professionals to 100 percent remotely manage Jabra USB headsets and speakerphones with a set of smart tools. Xpress keeps different devices, across multiple locations and with numerous users, always updated with the latest firmware. Xpress offers easy mass deployment and agile maintenance. It works no matter the platform you work with, or whether you’re working from your own premises, your own cloud-based service, or the Jabra cloud. And, call analytics received from individual headset users help your management team make data-based decisions to improve agent productivity and the customer call experience. These comprehensive insights include background noise, speech analytics, headset usage analytics and audio exposure. Jabra Direct 2.0 is a user-friendly desktop interface offering complete integration of your softphone and headset. 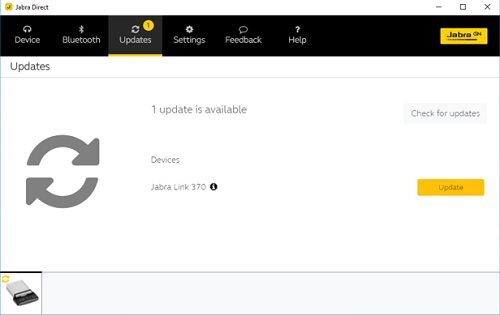 The Jabra Direct dashboard is a user friendly status menu available from the desktop notification area, typically accessed via the lower right corner of the desktop.The dashboard shows the status of your headset, if any updates are available, and if your softphone(s) are ready for use. By clicking your Jabra device in the dashboard, you will be linked into the Jabra Direct main application for managing setting preferences, start firmware updates or access applications that are available for your headsets. And did we mention, these software programs are available at no cost, for both Mac and Windows platforms? To learn more about Jabra Engage 50 headsets, call our Headset Experts at 1-866-998-9991.